BUFFALO, N.Y. -- On November 3 and 4, the Buffalo State Mock Trial team competed at the “Friar Faceoff,” St. Bonaventure University’s annual mock trial invitational, alongside 16 other teams from across three states. Mock trial is an intercollegiate competition in which student-witnesses and student-attorneys prepare fictional court cases for a simulated trial. Each year, the American Mock Trial Association (AMTA), the governing body for collegiate mock trial, puts together a new case complete with case law, affidavits, depositions, expert reports, evidence, and more. For this year’s fictional civil case, Midlands Television Studios Inc. v. Danny Kosack, the Buffalo State team was presented with a unique case. On June 29, 2017, defendant Danny Kosack was scheduled to appear with his chimpanzee, Elias, on the highly-rated show Midlands After Dark with Alex Grace (produced by Plaintiff Midlands Television Studios Inc.). A rehearsal before the show went terribly wrong when Elias attacked several people in the room. A writer for the plaintiff was killed during the attack and the plaintiff and defendant sued each other for negligence. For the first trial, the Buffalo State team was on the plaintiff’s side and then later on the defense. 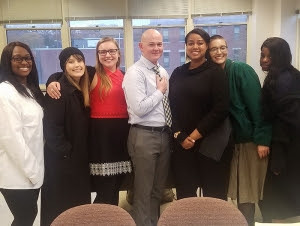 Hailey Ables, Jessa Matteson, Andrew Appleby, and Ta’Nira Newton competed as both attorneys and witnesses; and Teddi Hastreiter and Aniyah Williams were witnesses. Returning member Jalon Bobb joined the team Saturday morning as an attorney. Matteson received an “outstanding witness award”—given only to the 10 top witnesses out of the 150 competitors, and other team members received votes for either a “top witness” or a “top attorney” award. “Mock trial has given me a newfound respect for all the work that attorneys do,” said Matteson. More than 700 colleges and universities across the country participate in the national competition, which begins in February and runs to April. During the fall season, teams learn the case and compete in scrimmages and invitational tournaments. The Buffalo State team will compete again at AMTA’s 2018 Great Lakes Regional Tournament, which will be held at Buffalo State this February. Students of all majors and career goals are invited to join the team. For more information, please contact Ben-Merre at benmerdn@buffalostate.edu.